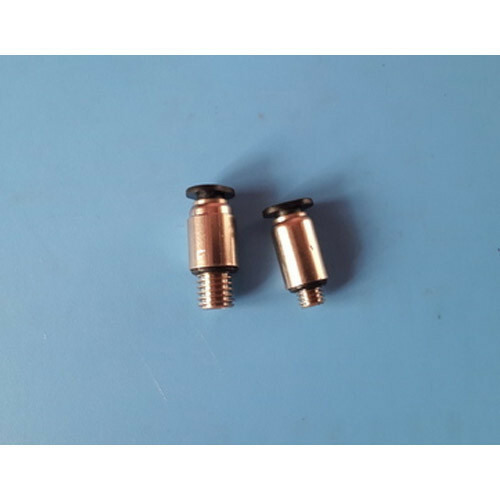 We are offering M5 x 4mm Round Solenoid Connector to our clients. Vimal enterpriises commenced its business activities in the year 2007 as a SoleProprietorship business with an aim to meet the growing need for hardware products of its customers from diverse industrial and commercial sectors. With our business offices situated in Coimbatore, Tamil Nadu (India), our company is engaged in the manufacturing, and trader of products such as Pneumatic Cylinder, Mounting Bracket, Pneumatic Control Panel, Pneumatic Equipment, Control Valve, Metal Valve, Pneumatic Fittings, and many more. We also offer services including Hydraulic Equipment Repairing Service. We have attained a strong hold over hardware industry in just a short span of time. Our hi-speed and technically advanced products are procured from the reliable manufacturers under the supervision of experienced professionals. Due to their contempo features, our products are extensively demanded by our national clients. The core principle of our company is to provide high quality products at the market leading prices within committed time frame. With our client-oriented approach, we have been able to maintain the cordial relationship with our valued customers.